Home Uncategorized A Visit with Simona Mulazzani–and a Book Giveaway! (2) the illustrator of that book, Simona Mulazzani, is visiting us here at PBB—all the way from Pesaro, Italy. 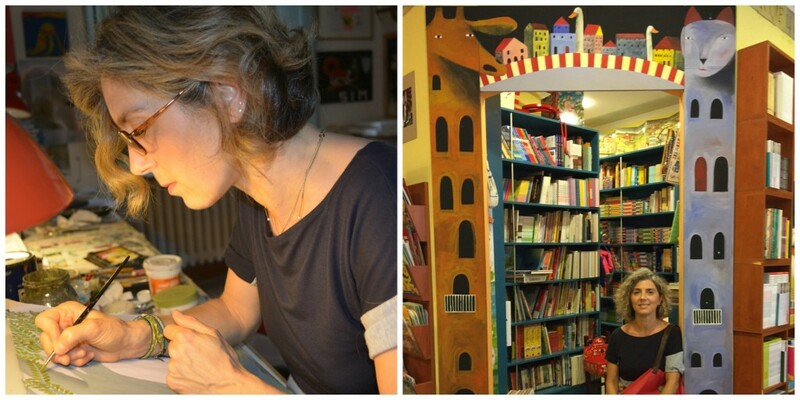 Here’s Simona in her studio, and at a local bookstore with her artwork in the background. 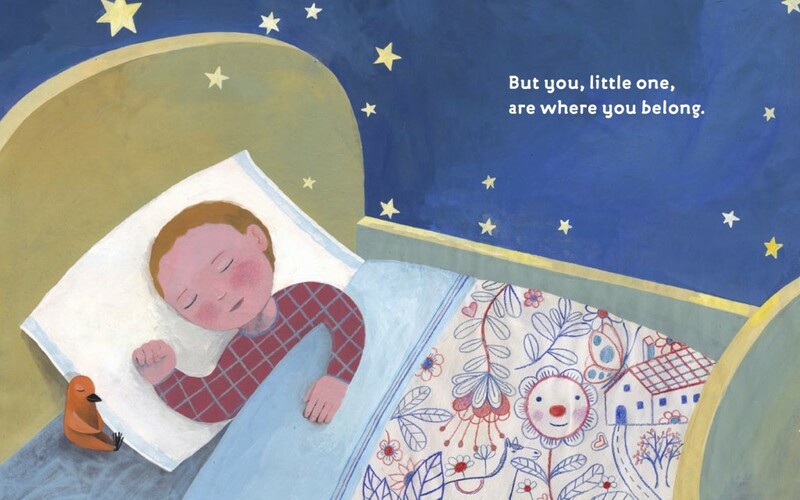 Simona is an internationally acclaimed artist with more than 90 books to her credit, but she’s only recently begun illustrating books for U.S. publishers. 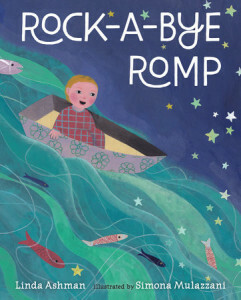 Rock-a-Bye Romp (Nancy Paulsen Books) is one of the first. 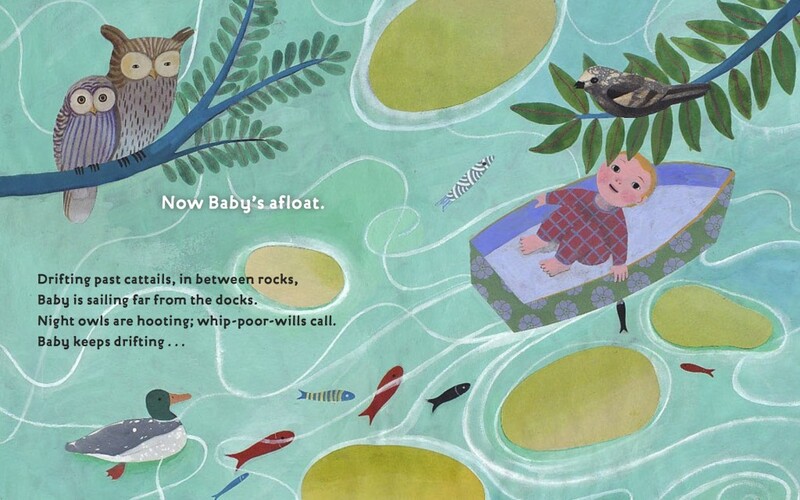 As you may have guessed, the book is a rewrite of the old lullaby. I always thought it was a strange one—what with Baby tumbling from that tree and all. Not exactly comforting! 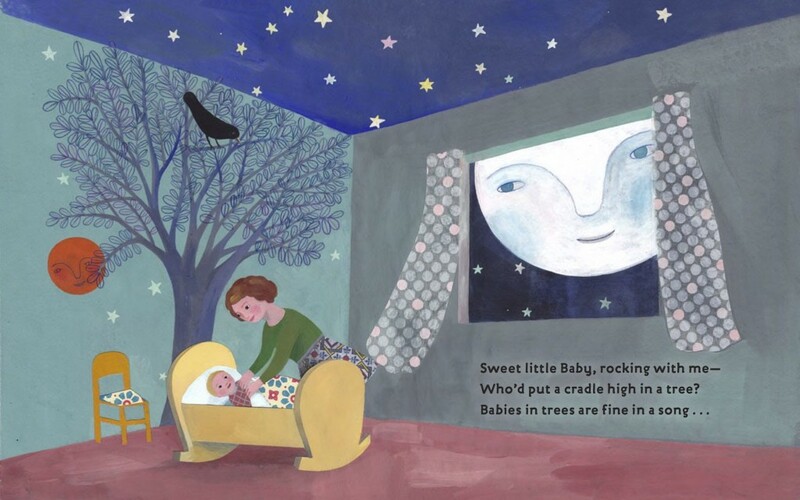 So, in the book, Baby has an even wilder adventure, but winds up safe in Mama’s arms in the end. Before we chat with Simona, here’s a preview of her artwork (click to enlarge images). Several years ago, Nancy Paulsen sent me an email saying she’d just met with this wonderful artist—you!—and shared some links to your work. (I was so thrilled when you said yes!) How did that meeting come about? In 2013 the Society of Illustrators awarded me with the Silver Medal for Original Art [for I Wish I Had]. So I had a very good reason to go to New York for the first time. It was a good occasion to meet some publishers, and my agent (Gail Gaynin) arranged for me a few meetings. One was with Penguin and in the end I was offered to illustrate Rock-a-Bye Romp. I was so thrilled! First time in New York, first time sitting with great US publishers…and going back home with a great assignment! Can you tell us something about your process? I think my process is quite traditional: I start with sketches, and when they get approved I go on to painting. At least this is the norm. As for the medium is easy: mostly acrylics on paper, colored pencil, pens and cutout papers, collage. I work in a studio in my home, in a small town by the Adriatic Sea, in the Marche region. I used to live and work (and still partially do) in another studio, in another home, in another, smaller, village only a few kilometers in the interior, in the middle of the hills. What inspires you and your work—in general and/or for this book in particular? Somehow it’s difficult to answer… I mostly like to illustrate animals and nature, in particular plants; less, maybe humans. This particular story fits perfectly in my “world”, so I really enjoyed illustrating it. The farmhouse and surrounding landscape remind me of the Italian countryside where we spent our honeymoon years ago. Are they based on a particular place? So beautiful! 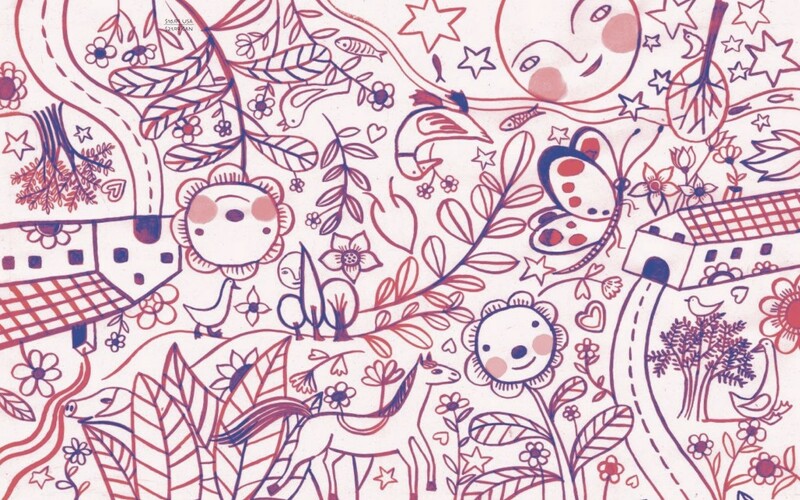 I also love the endpapers and all the whimsical touches—the sweaters on the pig and sheep, the faces on the trees. Can you tell us something about them? For the endpapers, I used the baby’s blanket’s decorations. I like to fill up forms (whales for example) with lots of drawings, letting them come freely as they want. We should ask these drawings what story they have to tell…. And, finally, I also love that sweet little bird next to baby’s pillow on the last spread. Is there a story behind it? That’s again something I’ve been doing for many years. 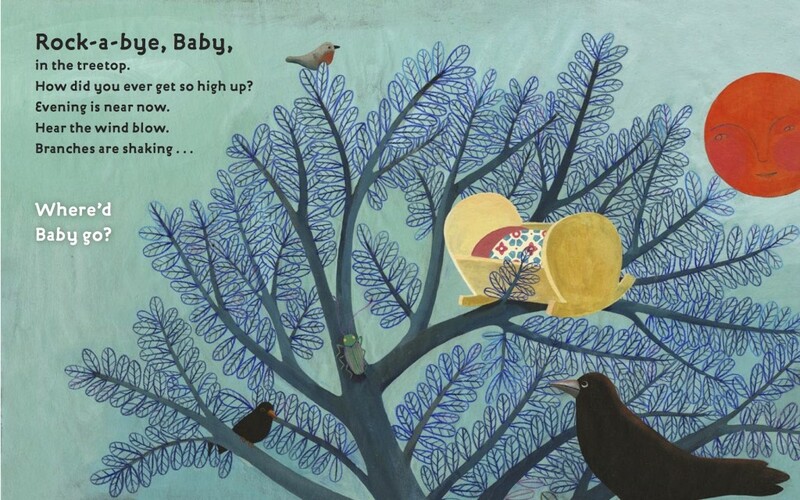 I put little birds in illustrations, often in unexpected places. Now there’s an overabundance of birds in illustrations… For me, really, there’s no reason other than that I like them…they “finish” the illustration. Thank you so much, Simona! You’ll find more of Simona’s wonderful art at the Morgan Gaynin website. interview, Linda Ashman, Nancy Paulsen Books, rhyme, Rock-a-Bye Romp, Simona Mulazzani. Bookmark. Oh, my! It is such a wonderful combination- your verse and her art. Love it! You and Simona have made a beautiful book! Love the text, love the artwork. Me, too! Thanks for coming by, Jama! I always worried about that baby falling, too. Thanks to you and Simona I don’t have to anymore! Beautifully written and illustrated! This book looks lovely! And I agree with you , Linda. Baby shouldn’t be falling! Thanks for a great interview, Simona and Linda. Linda, what a treasure! A wonderful match of art and text, can’t wait to see the whole book. Thanks, Sue. I wanted to show the whole book here–it was hard to choose! You are inspiring, your work is beautiful! What a beautiful book! I love reading about illustrators and their process. It just seems magical to me. Thank you, Jill. It’s one you can sing to the grand babies! What a beautiful book! Can’t wait to read it! It’s such a strange one, isn’t it? Thanks, Wendy! What a beautiful book, great pairing by Nancy Paulsen! 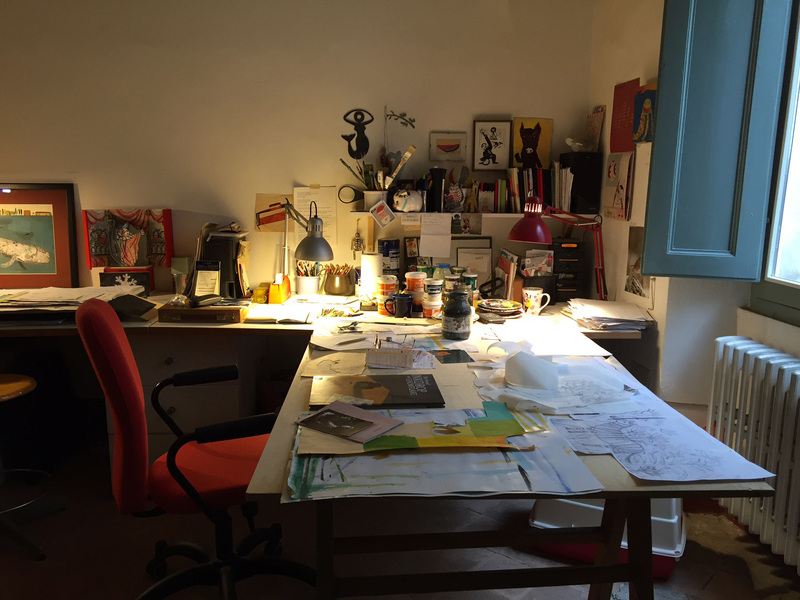 Thanks to Simona for sharing the studio photos and the painting by her father –stunning. And thank you, Linda, for the preview and giveaway! Yes, wasn’t it wonderful to see her father’s painting? Clearly, artistic talent is part of the genetic make-up. Thanks, Rachel! I’ve always hated that song because of the ending – thank you for righting that terrible wrong! The illustrations look gorgeous! I know–what an odd thing to sing to a baby. Thanks, Lynn! Such a lovely and charming book! Thank you for sharing. Thanks, Claire. And I agree about the musical name–and the dad’s too (Giovanni Mulazzani)! This looks lovely! Thanks for the post. This book looks amazing! The illustrations are spectacular. Thanks for the chance to win and for this post. Thanks, Rosi. Spectacular is a great word for Simona’s art. Love the whimsical in the artwork!!! I do, too. Thanks, Jan! Sweet book!! Wonderful landscapes and animals! Fabulous. Her art is amazing. I agree about the amazing. Thanks, Robyn! Congratulations on the new book, Linda and Simona! I love the illustrations, especially the soft shapes and the rich colors. Yes, I love those deep, rich colors. Thanks, Patricia! Absolutely gorgeous. What a sweet bedtime book–I am still oohing and aahing over the spreads! Thanks, Jennifer! I’ve done lots of oohing and aahing here too. Thank you for the insight into the artist. I love her bare walls in her studio. They look like my art room walls, so i know I’m not alone! Thanks, Susan. I love getting a peek into artists’ studios, too. 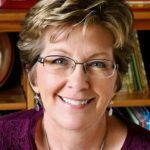 Congratulations on your new book, Linda! And great interview with Simona! This book looks just lovely. Congratulations on another beautiful book. I can’t wait to add this to my shelf. Such lovely illustrations!! Congratulations, Linda/Complimenti Simona. Beautiful! What a lovely collaboration. I love these insights into the creative process. Thanks for a great post! Congratulations on your stunning new book. I would love to enter your Goodreads giveaways but they are sadly only for US citizens. Congratulations, ladies. You make a great duo. A great baby book! Thanks for sharing the interview and pages from the book. Thanks, Linda. Always so nice to see you! This is a lovely combination of beautiful words and gorgeous art. 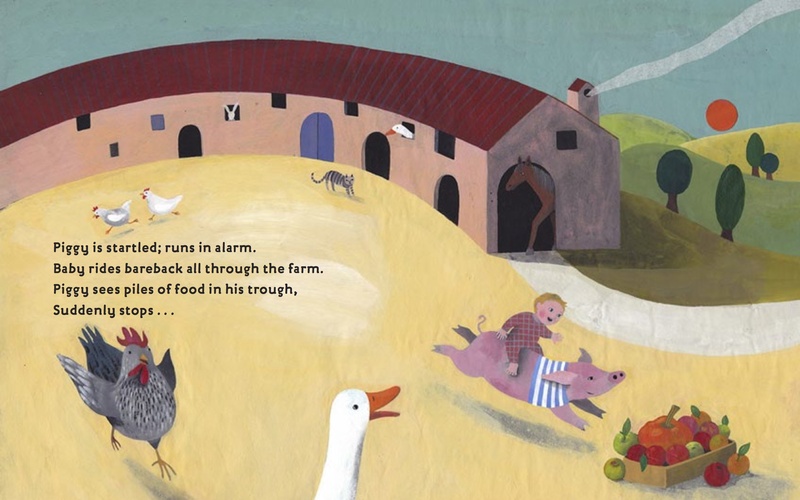 These are the kind of picture books that I drool over– a true work of art. Thank you for sharing. Thank you, Kelly. I agree that Simona’s art is gorgeous! I loved learning about Simona’s process. I’m going to read this book and check out where Marche is in Italy. Looks like a beautiful area! The illustrations have beautiful detail. You are a wonderful illustrator. 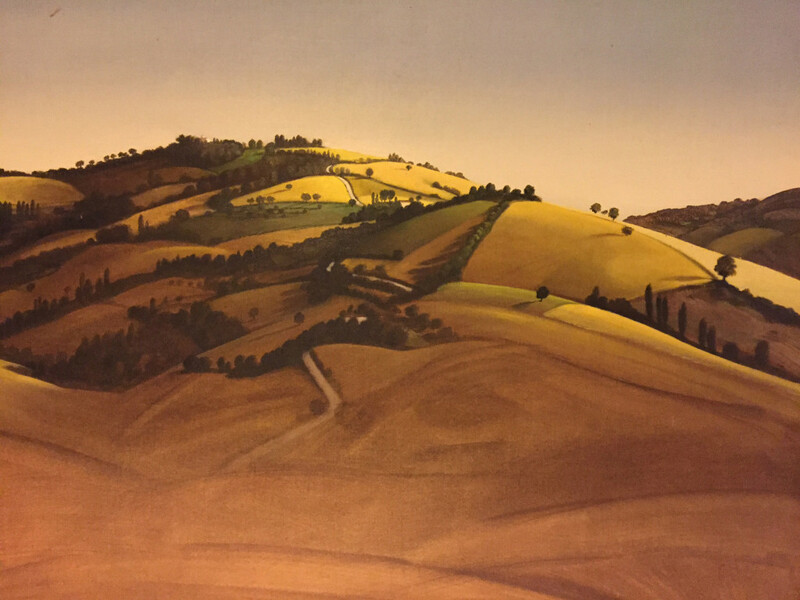 I know, Sue–I had to check out the Marche region to see what it’s like. And I agree that Simona is wonderful! Congratulations on this gorgeous book!